Gershuni Moshe (1936-2017 b. Israel) Studied at Avni Art institute, Tel Aviv. 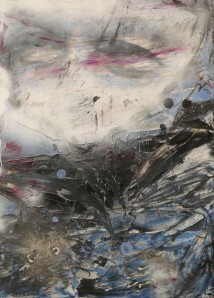 One of the most prominent contemporary Israeli artists. Held his first solo exhibition in 1969 at the Israel Museum, Jerusalem, showing abstract paintings beside sculptured objects. Recipient of many awards including the 1988 Minister of Culture Prize for Painting and Sculpture. In 2003 Gershuni was awarded the national Israel Prize For Art, however the prize was revoked due to his refusal to participate in the prize ceremony. Held many solo exhibitions in Israel and abroad including a retrospective of his work at the Tel Aviv museum of art in 2010 and at The Neue National galerie, Berlin in 2014.